Some March moments from my Instagram profile, @insta_lilliness. I tuoi primi piani sono stupendi, hai proprio un bellissimo viso Lilli! your new key chain is adorable:) I love the symbolism of boxing glooves...all the photos are really cute...I really like that selfie with curly hair...you look so pretty there! ho ufficialmente voglia di pane e nutella! Hi beauty! How are you? I like your Instagram, maybe we can follow each other? bella la foto con gli ovetti, me l'ero persa! It sure was a beautiful month!!! Love your new hair style!!! You look gorgeous in all your selfies!! Have a lovely April month!!Hug! Che belle fotine!!! Belli i tuoi outfits di marzo, bellissimi i primi piani e il tuo make-up sempre perfetto!!! adoro il balsamo per le labbra dei Minion, lo voglio! tenerissimo il biscotto a coniglio! i tuoi selfie sono sempre stupendi, in particolare adoro quello con i capelli mossi! Lovely recap, I just love your sunday selfie, you look so beautiful! Enjoy your new black boots and the new month. Ma che tenero il burrocacao dei Minions..
Sempe carinissimi i tuoi scatti Lilli! Eekkk! I love Minions too and that lip balm is too cute! And you terrible, Lilli...tempting me with pizza. LOL! I love pizzas and pastas and I will eat them everyday if possible. But if I do that then I would be 200kg soon. Haha! 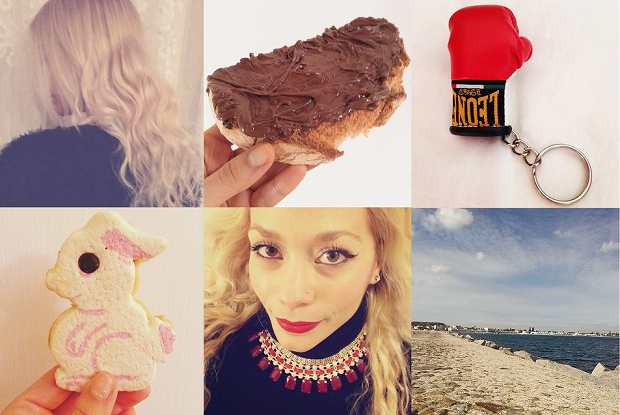 Dear Lilli, very nice pictures of your Instagram Account. It´s always a pleasure to see little details of your life. At the moment i got technical issues with my internet access and miss all my favorite Acounts like your. I hope i will be back the next days. Thank you for sharing all this nice moments and i love the beautiful sky picture. Allora Lilli, io e te ci dobbiamo assolutamente trovare per una merenda!! :D E poi voglio anche io il burro-cacao dei Minion!! You look great, as always, but food is my weakness. Don't tempt me, Lilli. I love the collage like set up from Instagram.... Beautiful photos!!!!! Looks so fun with vibrant colours and patterns here. The pizza looks so yummy. I hope you will have a fantastic April. Beautiful pictures, Lilli! The pizza looks so good love! Those easter chicks, bunny and eggs are just too cute. Easter is such a pretty time of year. That nutella looks so good. I would love to have this Nutella on bread and the croissants for breakfast now! Che bello Lilli questo recap... e quel panino con la nutella a quest'ora fa davvero gola!!! Il rossettino Minion ancora non sono riuscita a trovarlo, sai???? ...il pane con la nutellaaa :)...sono in casa con l'influenza e se ora vado a mangiarmene una fetta è colpa tua!!! I am so happy to see your recap! I really still want that Minion lip balm and I really want to find one for myself! :) I loved your beautiful outfits and every outfit was so perfectly layered! I just adore your coats! You have certainly had some tasty food this month. The pizza looks amazing and of course nothing comes close to an authentic pizza in Italy! The bunny cookie is so cute too. Great pastries! The pastel pink coat is perfect for spring. I hope you have a lovely Easter! Well, your hair looks like it's blonde naturally, so well done, Lilli! What's your natural colour then?